Shackleton's attempts to find the South Pole. 069. SHACKLETON'S ATTEMPTS TO FIND THE SOUTH POLE. Issued by Oxo Limited. (1934). Card number 24 from a set of 24 entitled "Feats of Endurance". Size: Ca. 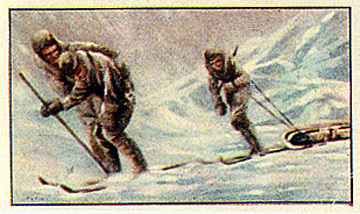 2.15" x 1.35"
Recto: Two men manhauling a sledge in snowy conditions. Verso: FEATS OF ENDURANCE | SERIES | 24 SUBJECTS | No. 24.--Shackleton' attempts to | find the South Pole | Sir Ernest Shackleton made three brilliant attempts to reach the South Pole on board the "Nimrod," in 1907-9, and finally came within 100 miles of his objective. His death occurred on board the "Quest" at South Georgia, in January, 1922, while on a voyage to the Antarctic. | "OXO" is also sold in Bottles :-- | 1 oz. 7d. 4 oz. 1s. 11d. | 2 oz. 1s. 1d. 8 oz. 3s. 6d. 16 oz. 5s. 6d. | An OXO a day keeps illness at bay | Issued only with Oxo Cubes | "OXO" | LIMITED | THAMES HOUSE, LONDON E.C.